When it comes to films, this fall has definitely delivered some excellent ones. From the highly anticipated Venom to the delightfully entertaining A Star Is Born, there truly was something for everyone. And with so many projects releasing, there’s no way you can go and watch everything But while those films and others like them flooded advertisements across the globe, there was one that I personally believe did not receive the attention and praise that it undoubtedly deserved. When it comes to the best films of the year, Bad Times At The El Royale earns its spot on that list. The cast’s performance was one of the strongest I’ve seen in a long time. I mean having the likes of Jeff Bridges, Jon Hamm, Chris Hemsworth or any of the other actors in this film in any project almost always guarantees commercial and financial success to the companies involved. All of those incredible talents in a single project, there’s nothing less than a jaw-dropping experience is to be had. The entire cast is brilliant in this film. They all bring a level of originality and personal flare to their performances. Never once did they feel dull or stagnant, always finding ways to keep the audience invested in everything they did. There was so much life in them, I forgot they were actors. That is such a hard feat for an actor to accomplish, and I can almost guarantee that for the rest of these actors’ careers this movie will be one that audiences always come back to. The plot for Bad Times at the El Royale is hard to explain for two main reasons. First, I can’t really say anything without spoiling parts of the film. It’s a discussion film. That’s a film that absolutely needs to be seen a group of people, even though it can still be enjoyed watching it by yourself, as I did. That way you can talk about how you felt and what you say during the film and share that with your friends. Second, this film plot is unique. It’s not exactly a single plot. Rather, it’s a plot that’s made up from the combined plots and journeys of all the characters who come to and stay at the El Royale. The film is broken up in chapters, each named based on a room in the hotel. Every chapter shifts its focus to the individual staying in the room number the chapter’s named after. This style of storytelling is phenomenally executed, and a great way of showing how everyone and everything is connected to varying degrees. 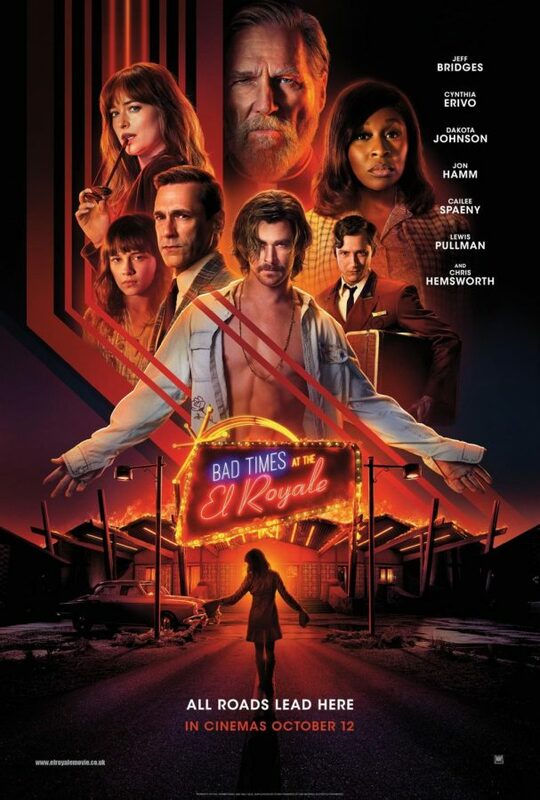 With its outstanding storytelling and stellar acting, Bad Times At The El Royale is a must watch. A fantastic film that really left me wanting more by the end of it, saddened when it ended I was completely captivated by the combined effort of cast and crew in this Oscar-worthy experience. This earns its nine out of ten rating.